The Weather looked good and the Sea Drag’n Team had high hopes of having a good finish in the 2012 Sneads Ferry Kmt. This tournament has always been a favorite of the team and they have been fortunate enough to have several top 3 finishes, including a 1st place in 2003. The team for this week comprised of Capt. AL, First mate Brent Bunn, and long time friend and fishing buddy, Andy Hinton. We all woke and got aboard the SeaDrag’n at 4:30 am. With a forecasted light SW wind, the team headed east to the fertile waters of the east side of Cape Lookout. Bait came aboard first after Capt Al and Andy made one toss of the cast net. Beautiful Pogeys filled the bait well of the 28 ft. Privateer and the Mercury’s were screaming to the east. After a short run, the team cleared Drum Inlet and sat down in 45 ft. of water. Capt. Al and the crew looked at the water clarity which was still a cloudy green. The team decided to continue on to a spot further offshore in hopes of clear blue water. After a 14 mile run, they settled in near a spot called the 1700 rock and began to put out baits. 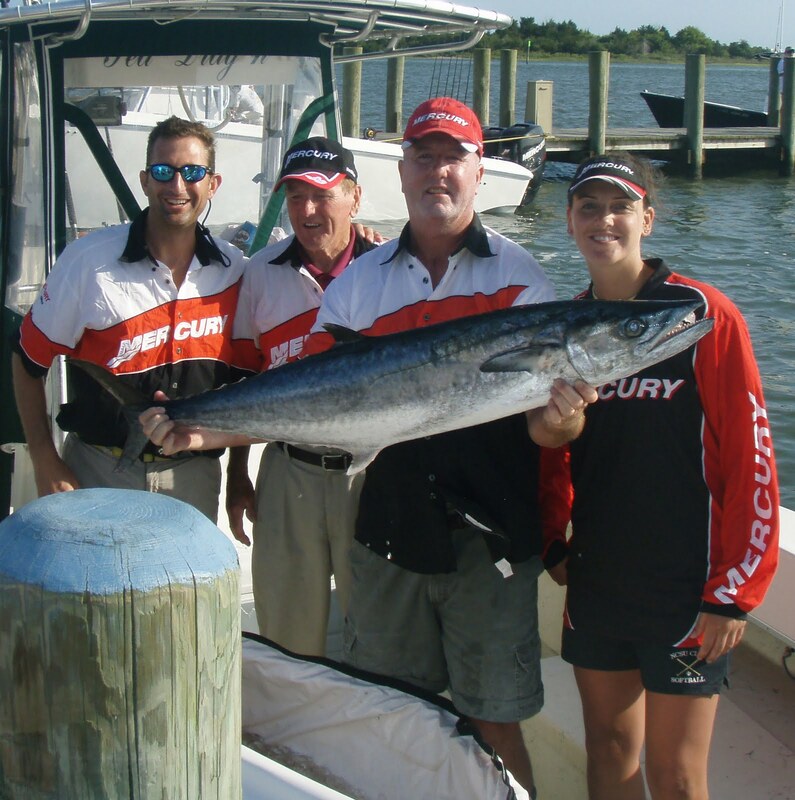 The area was already covered with about 20 boats so the team stopped short of the fleet and began to fish. The first lines went out and within 15 minutes, the downrigger ripped off. Capt. Al grabbed the rod and handed it to Andy as he and Brent cleared the deck. After a short battle, a mid 20’s pound fish was onboard. Nice point fish, but the team was in hopes of a better fish. Capt. AL and Brent began to put the lines back out. Capt. AL put a jumbo pogey on the long line and deployed it in the wayback position. Before everyone could get relaxed, Brent yelled “Thirty or Forty just skied on the long line!!”. Simultaneously, the reel began screaming line off. I grabbed the rod and gave it to Andy. Brent and I cleared the deck. Once cleared, Andy yelled for me to come grab the rod. I took over the reel which had lost over 300 yards of line from the fleeing fish. Brent turned the SeaDrag’n and the chase was on. After four big runs , the fish came up and down under the boat. 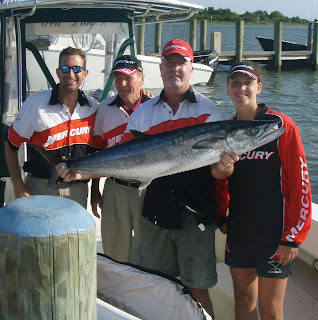 Capt AL eased her up and could feel it was a large fish. After 15 minutes, color could be seen under the boat and the crew looked under the bow to see a monster Kingfish!! Capt AL shouted for Brent to get the long gaff and after two more big cranks on the reel, the big girl was in striking distance. Brent reached down as far as he could and stuck the monster in the back of the head. Capt AL reached over and grabbed the gaff as Brent struggled to get the big girl over the side. She hit the deck with a big thump and never moved. The Team high fived and celebrated what they hoped would be another good finish in the tournament given the size of the slab on board. The fished measured over 59” in length and they all felt she was well over 50 lbs. The team packed her in ice and began a slow journey to the scales at Sneads Ferry. They arrived early and anchored down in front of the weigh in site waiting for the scales to open at 3 pm. The big girl pulled down the scales at 52.69 lbs and was good enough for the team to capture another 1st place win at the Sneads Ferry Tournament. 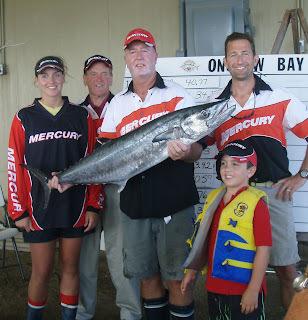 The SeaDrag’n Fishing team would like to thank the team sponsors Mercury Marine, Bellhart Marine, Sea Striker and Star Rods. 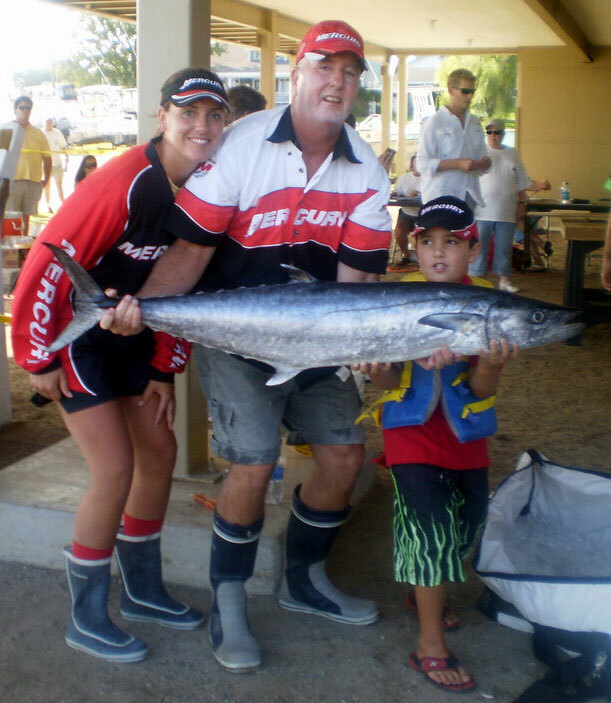 Their sponsors support and great products are so important to the team being able to compete on the SKA Kingfish circuit. Fall is just around the corner. This past weekend the Sea Drag’n fishing team competed in the Atlantic Beach KMT. Bait earlier in the week was a struggle to fiind, but luckily it showed up on Tournament day. 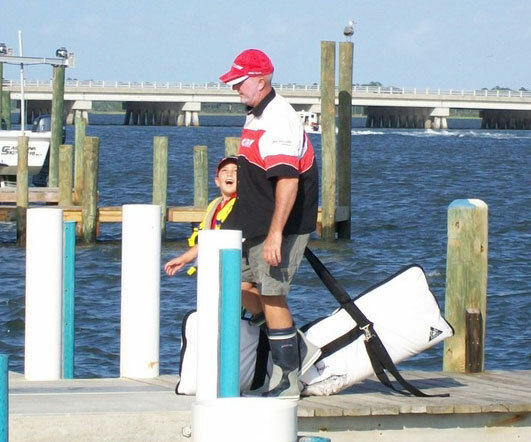 We slid over to Harkers Island and with two casts we had all the slippery shad we needed. We hammered down to the east side through a downpour of rain and lightening. Finally after busting through the breakers, the seas calmed down offshore. The wind was light out of the NE and the ground swell was about 3 to 5 feet. Fishing conditions were good and the water temperature was perfect at 76 degrees. Bait was plentiful and things were looking positive. We began to put out lines in 50 foot of water and after the third line went out the top line screamed off. After a short battle, a 24 pounder was lying on the deck. The day was filled with action, between the 12 sharks, 9 kings, 1 grouper and 1 spanish, we went through about 30 rigs. At about 11:30 am our best fish of the day ripped off the downrigger and made a impressive 250 yard run. After about a 20 minute battle, Brent stuck the girl with the cold steel and laid a fat fish on the deck. She had the head of a 40 pounder with a big eye ball, but just did not have the length. It pulled down the scales at the weigh-in at 28.1 pounds and was a good 3rd fish to add to our SKA points in Division 1. 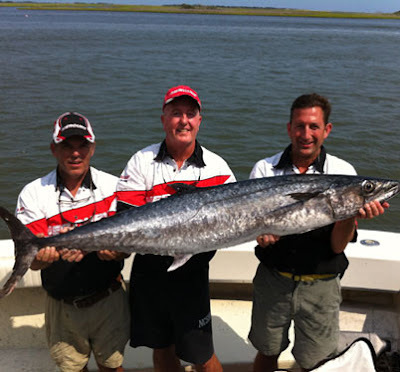 Hopefully hot fall fishing is just around the corner and up next for the team is the Swansboro King Mackerel Tournament on October 15. Then off to Biloxi for the SKA Nationals. 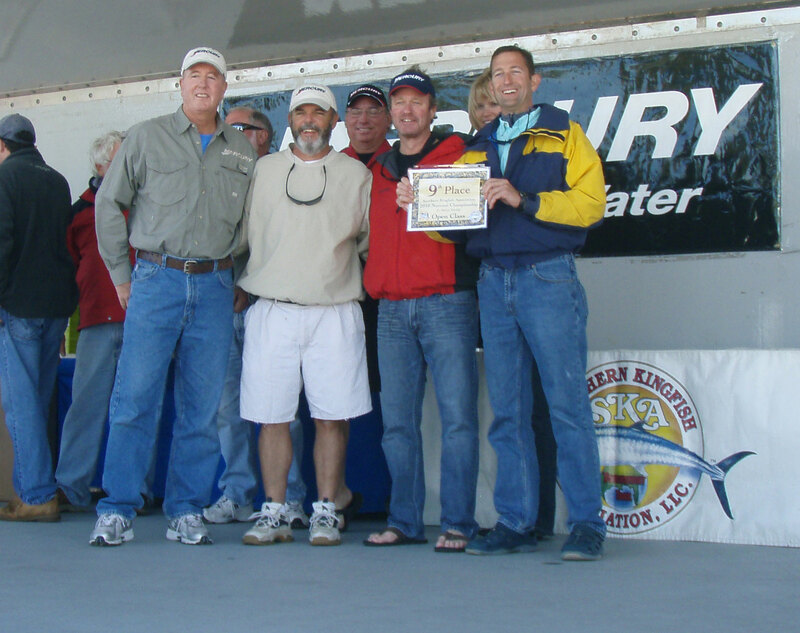 Sea Drag'n Fishing Team placed 9th overall in the SKA Nationals this year in Ft. Pierce, Florida. 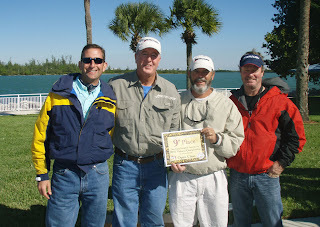 Here are a few pictures of the Sea Drag'n Fishing Team during and after the awards ceremony on Saturday, November 6 in Ft. Pierce, Florida. Sea Drag'n Places 9th in SKA Nationals! The Sea Drag'n fishing team headed down to Ft. Pierce, Florida for the SKA Nationals and found out the trip was well worth the long haul. The crew weighed in two fish today one weighing 32.57 lbs. 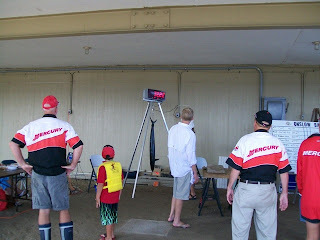 and the second fish weighing 24.20 lbs for a total weight of 56.77 lbs. The above picture is of the fish they didn't weigh in. We hope to have more pictures soon so be sure to check back. Visit the SKA site to view all of the winners. 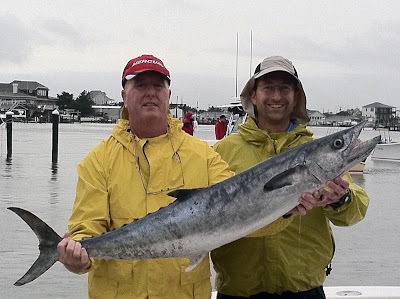 The Atlantic Beach King Mackerel tournament that was scheduled for this weekend, September 18, has been rescheduled due to rough seas because of Hurricane Igor. Better to be safe. The tournament is rescheduled for September 23-25, 2010. Click here for tournament details. Now That's a BIG Fish! 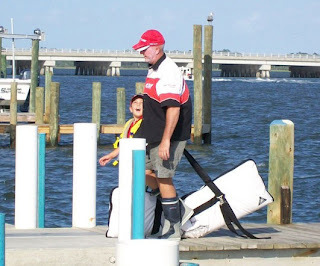 inshore action with the red drum in Core Sound. Now that's a fat red drum! back in the water. Maybe you'll catch him next year! Now that was a good day of fishing! 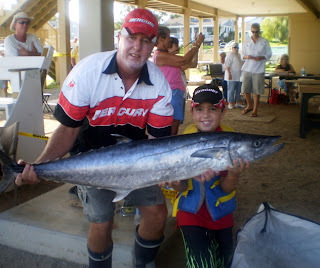 Next King Mackerel tournament is Atlantic Beach. The full team competed on Saturday during the Onslow Bay Open KMT. Lauren, Dad, and Brent pulled into Atlantic Beach on Friday night. After some boat repairs and rig tying the crew fell out for a few hours of sleep. Up and going by 4 am, we headed the bow of the Sea Drag’n toward the bait waters of Core Sound. Two throws of the Calusa’s and the boat floor was slimmed over with menhaden. Dad putting them in the tank as quick as possible and Lauren jumping around trying to keep the slim off her boots. Tanks full, we headed the Sea Drag’n to the fertile waters of the east side. One quick stop near shore and then to the offshore spots. Fishing was a little slow early on. One small King and two reef donkeys(aka Sharks). At 11:00 am the dinner bell sounded for our fourth place fish. The port downrigger ripped out just as I got ready to check the bait. The line ripped off and drags were squealing. I grabbed the rod and gave it to Lauren and the rest of us went to work clearly the deck. Lauren was on the bow yelling for us to hurry up because the line was still ripping off. The fish made a good 200-yard run then settled down deep. Fifteen minutes later Lauren had the slab to the surface. Brent reached out into the 4-5 foot seas breaking the surface and sinking the steel in the side of her head. He pulled her over the side and she hit the deck with a thud. Not extra long, but Fat Fat. We continued fishing for the 40 and 50 lber but it never happened. At 3 pm we packed in it and headed south to Casper’s Marina for the 6 pm weigh in. We unloaded the girl and watched as she pulled the scales to 32.23 lbs and a 4th place finish in our 2nd King Mackerel tournament of the year. Next up, the Sneads Ferry KMT and hopefully the KingGods will have one waiting for us. Good luck to everyone fishing and be safe. Captain of the Sea Drag'n Fishing Team. The Sea Drag'n is a 30 foot Privateer that has twin Mercury motors and fishing off the coast of Atlantic Beach, North Carolina.